Jay-Z is not only an Executive Producer on the movie, his music also worked it’s way into the creating of one of the scenes. 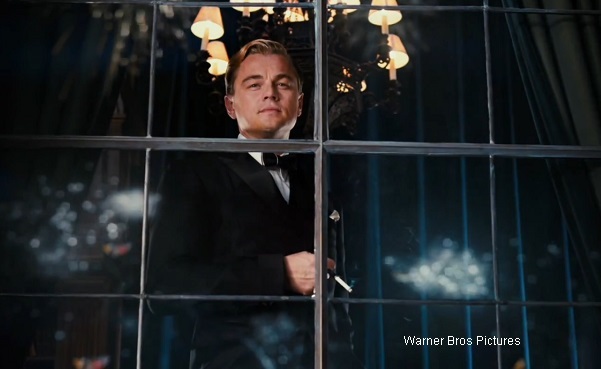 When the time arrived to shoot the big party scene in “The Great Gatsby”, Luhrmann said at about thirty minutes from wrapping, they still hadn’t gotten that “wild party feel.” The scene was inspired by a book called “The Wild Party” which was a book given to Luhrmann by DiCaprio’s father, George. The book was written in the same period as “The Great Gatsby”. To help create the atmosphere, Luhrmann had his assistant dress-up as the bell-hop that brought sandwiches in the book. With twenty minutes left, all the cameras rolling, jazz playing in the background, they turned up the track called N.I.P. by Jay-Z & Kanye West and it was mixed with the jazz. “We made a special track” said Luhrmann. The result – a very expensive lamp smashes right in the middle of the movie. “There was clothes coming out and feather fighting and throwing flowers,” said Luhrmann. The making of “The Great Gatsby” had to come in on budget. The only way Luhrmann and his team could do that was to re-create Long Island in Australia. “The whole challenge was to make the movie in Australia. That brought a bit of a weird problem that we could have never foreseen. There was this English mountain that people went up and planted trees. We were going to create Long Island up there. We got rained out five times… We shut down, came back in February and it rained again,” recounted Luhrmann. When talking about the cast of “The Great Gatsby”, Luhrmann stated, “We were a theater company. It was a true collaboration that began extremely earlier.” He also said that every actor that was brought in began collaborating in the process. They’d ask – “do you think I can get that line in?” The lines he said they were referencing were those from the real-life letters from Zelda Fitzgerald to Scott, and letters from Ginevra King, also to Scott.